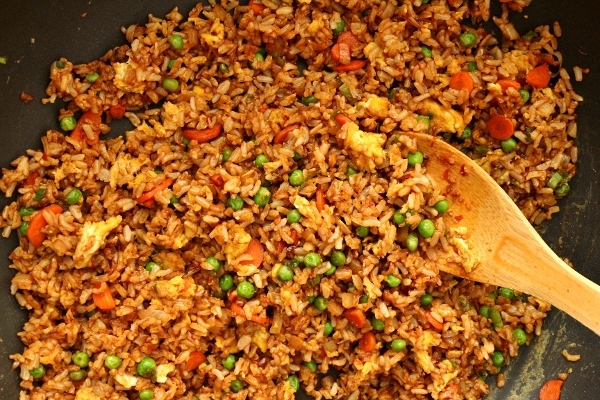 Fried rice is an Asian staple, whether it is flecked with pineapple chunks and doused with curry powder (Thai), or studded with bites of roasted pork (Chinese). I love making homemade fried rice. This allows me to control the quality of ingredients and the amount of sodium, something that can easily get out of hand at a local take-out spot. 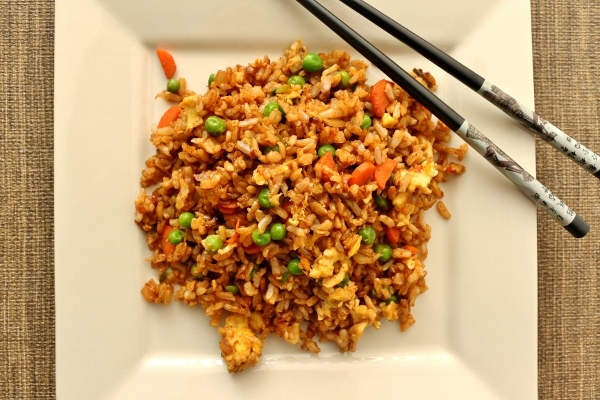 I actually use plain brown Jasmine rice from Trader Joe's for my fried rice. 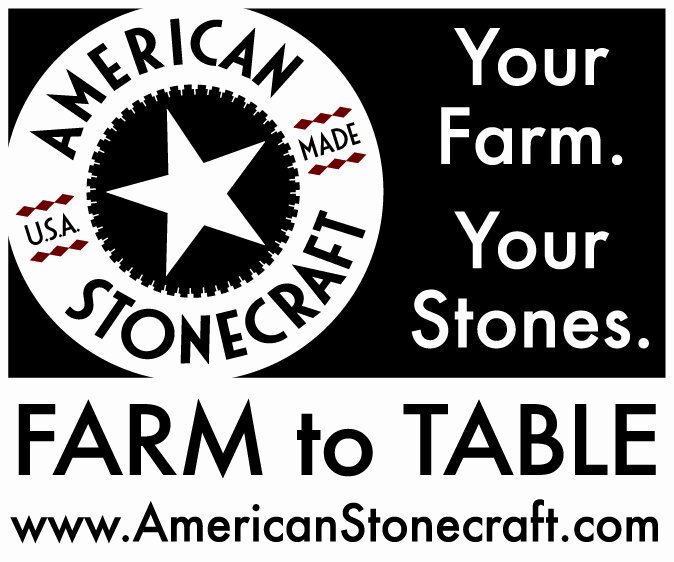 It makes it a touch healthier, and you can barely tell a difference once it is seasoned. Definitely plan to cook the rice in advance--once it's done, I like to spread it out on a sheet tray to cool and dry out. 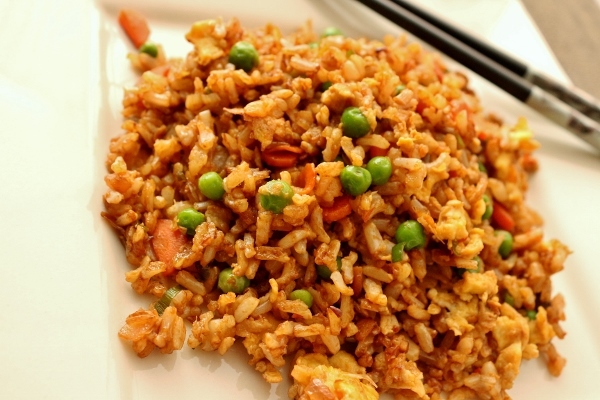 The key to good fried rice is to have relatively dry cooked rice. I also like my fried rice a touch on the spicy side. 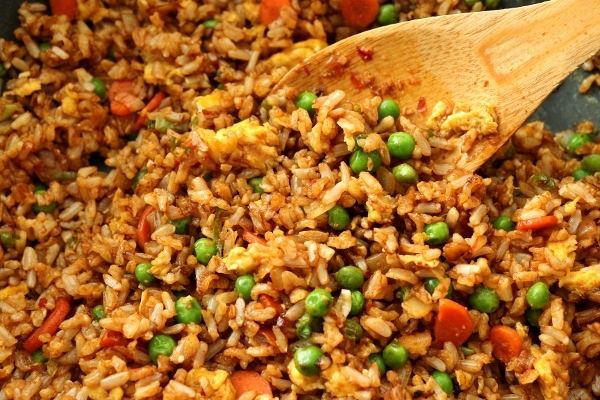 I use garlic, ginger, and Sichuan chili bean paste--the main source of heat in this fried rice dish. I used basic vegetables like onion, carrot, and peas, but you can easily add any of your other favorites as long as they are all cut to about the same size so they cook evenly. This rice is technically not vegetarian because I add some scrambled egg at the end for protein. You can easily omit the egg, or even replace it with shredded chicken, or char siu (in the past I've cubed up leftover char siu pork tenderloin in this rice and it was fantastic!). 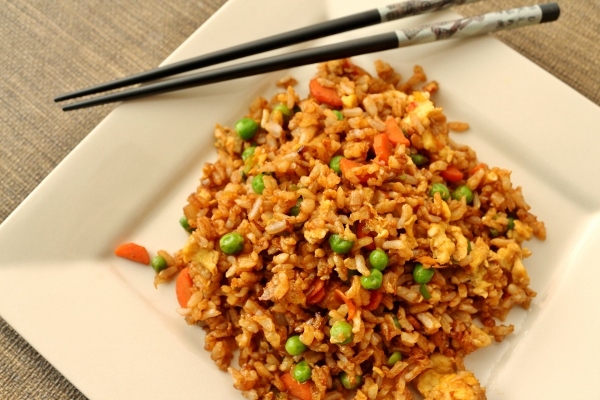 Regardless of what you use for veggies or protein, this has so much more flavor than your standard fried rice. Heat oil over medium-high heat in a large non-stick or well-seasoned wok. Add the onion and carrot and saute for about 5 minutes until the vegetables are tender. Add the chili bean paste, garlic, and ginger and continue to saute for another 1 to 2 minutes until fragrant and golden. Mix in the peas and scallions and cook for another 1 to 2 minutes. Add the rice and saute to combine, allowing the rice to dry out in the wok a bit as you continue to stir, about 1 to 2 minutes. Add the soy sauces and saute for another 1 to 2 minutes to combine, then push the rice to one side of the wok and add the beaten egg to the vacant side. Allow the egg to cook, occasionally stirring the egg to gently cook until it's no longer runny. Then combine the cooked scrambled eggs into the rice to finish it off and serve immediately.